Am 17. 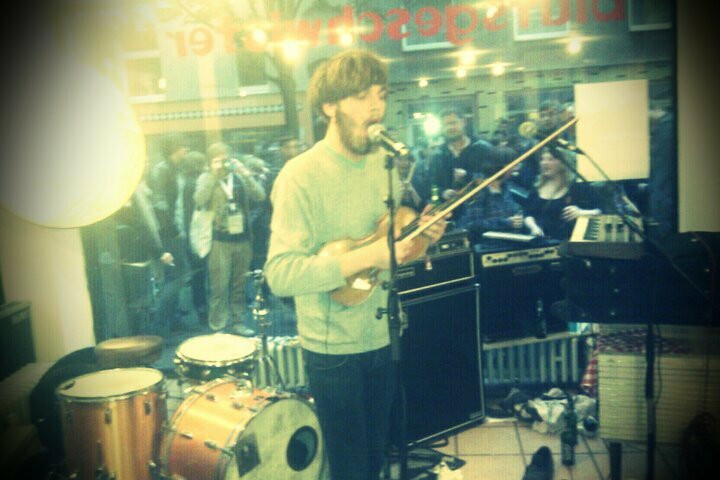 Juni gibt es ein spezielles Konzert von Sweet Sweet Moon. In der Besetzung Geige (Matthias Frey) & Cello (Lukas Pöchhacker) werden sie akustische Perlen zum Besten geben. Sweet Sweet Moon, that’s first and foremost young Austrian multi-instrumentalist Matthias Frey. Alone on stage he is creating an almost orchestral sound with violin, synths and his best sidekick the loop pedal, revealing artistic ties to the likes of Owen Pallett. For his studio recordings Matthias also plays the drums, guitar or accordion himself. Sweet Sweet Moon is known and loved for his quirky and charmingly chaotic live appearances and leaving behind lots of smiling faces at last year’s c/o Pop in Cologne. His debut EP „Pompidou“ came with a folk like singer-songwritier style predominated by acustic guitar and melancholic vocals. Since then the onepalband from Vienna made tremendous progress. His marvelous cover version of Beirut’s „My Night With The Prostitute From Marseille“ already indicated the direction of his artistic development integrating looped violin hooks and upbeat electronics. Matthias is orchestrating all pieces himself. With “Smoke Up“ he’s delivering his the pop-iest track, neglecting the melancholic ambience that used to characterise his sound.